The lines that form Middle Eastern and North African countries have been in a state of flux from the Umayyad Caliphate to the Ottoman Empire to the Second World War and thereafter. Even in the past few years with uprisings from Tunisia to Syria, as well as the ongoing conflict between Palestinians and Israelis, as well as conflicts between secular and religious ideologies, the political and cultural boundaries of these various countries are unclear. And though the lines of governance change over time what is left from every empire and every wave of political and social change is the art that takes account of these events by making that which is invisible seen. Marta Herford is presenting Suspended Territories: Artists from Middle East and Africa, an exhibition comprised of nine female artists whose works range from photography, sculpture, installations, and video. Many of these artists are now living in Western countries. Whether living within their native homeland or in foreign countries, each artist renders a ‘territory’ not limited to physical borders, but also as emotional and intellectual spaces. For Western audiences the nuances, even the broad strokes, of Middle Eastern and North African history can be too complex to register. 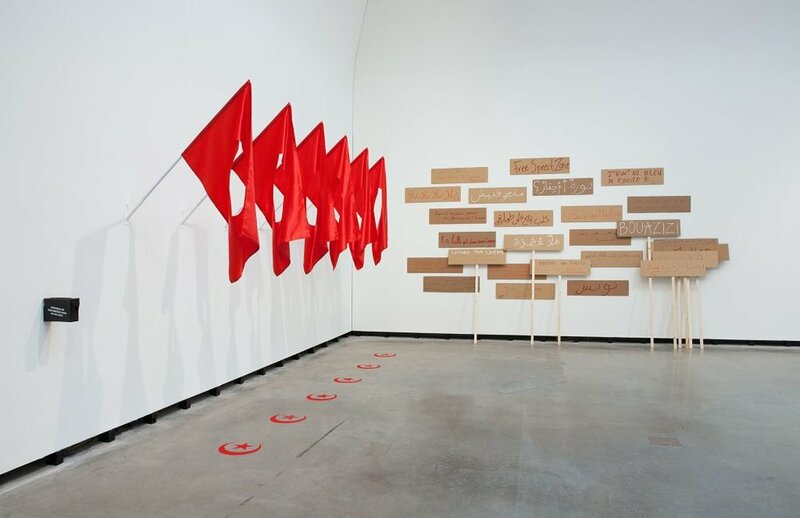 But through a personal connection with an artist and artwork this exhibition can also broaden the emotional and intellectual boundaries they perceive of Middle Eastern culture. In Saba Innab’s Untitled from the series How to Build Without Land the undeveloped line reflects the unrecognized state of Palestine within Israel. Since 1946 until present the Palestinian territories appear to gradually be vanishing off the map. Seeing the Palestinian territories dissolve one wonders what will become of their people in a hundred, fifty, twenty, ten years. The future of the physical Palestine is in suspension. Interestingly, for two thousand years the Jewish people were without a state, but their traditions, religion, and community did not dissipate. A nation without a land can still perpetuate its culture. We similarly see that those immigrants, whether from Palestine, Iran, or Syria, have extended their culture beyond the borders of their native lands. Immigration is another key theme that underlies many of the works. Over the course of seven years Sama Alshaibi retraced the journey of fourteenth century-explorer and scholar Ibn Batūtah and documented the landscapes of fifteen Muslim countries through photography and video. She originally presented these works in her exhibition Silsila, which is the Arabic word for “chain”. Through her performance in these various landscapes we explore humanity through the landscape of her body. 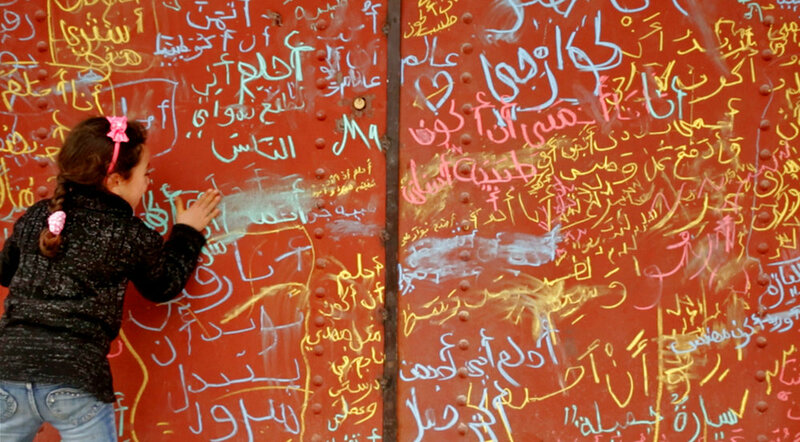 This series comments on the physical and psychological effects of war and exile. By taking this journey, migrating to numerous territories, crossing borders, she reveals the individual as the only constant in an ever changing landscape, whether it be environmental, political, or social. And that the individual, even in exile carries with them their history and traditions. Memory suspends the past. Memory is also a vehicle to bring forth the past into the present. In Lamia Joreige’s video testimonies in Objects of War the artist uses mundane objects from the interviewee’s life as doorways into the Lebanon War. A toy car, a bottle of turpentine, or a penknife are catalogued like artifacts that will forever preserve the memories and lives of Lebanon. The temporal division of past, present, and future that correlate with their respective physical boundaries are diffused in the memories of war and exile. The present is always just the fruits that come and go with the seasons while the roots remain unchanged underneath the soil. In Suspended Territories the artists are like cultural archeologists digging into the political and social sediments of the past and the present. 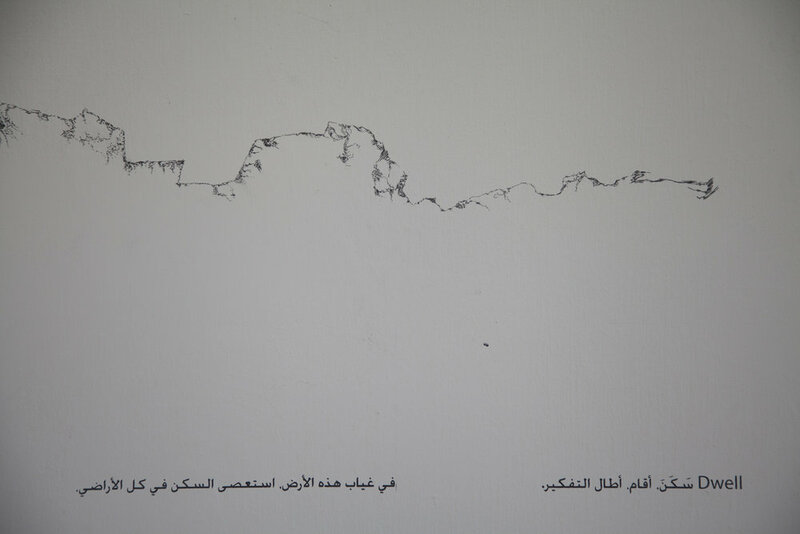 Amina Menia’s Lost Qibla shows the topography of a necropolis, a city of the dead. These photographs clearly depict the relationship between time and space. Each relationship between the artist and their culture is a relationship between time and geography. Introspection of the temporal historical territories in correspondence to the physical geographic territories is a contemplation of death, and rebirth. The laws of physics state that energy cannot be created or destroyed, it simply takes new forms. Death is between forms. What we define as death is simply the transformation of energy, yet when forms break down we mourn that form. We might celebrate and immortalize that form through a ritualistic system, such as a funeral, or honor it intellectually, such as documenting it in a biography. Or contemplate it through art. The artworks in Suspended Territories memorializes form, they deconstruct form, they construct form, and they transcend form. The social and political issues the artists address become multidimensional. These artists touch the soul of what lies between time and form— identity. Through examining their identity as an Arab, as a Middle Easterner, as Muslim, as an immigrant, as a woman, as an activist, as an artist the lines that divide Western and Middle Eastern, native and immigrant, man and woman are transposed. Form is not fixed in the way we perceive it in the moment it is suspended. Like Mounira Al Solh’s wordplay in Sama‘/Ma‘as, we can rearranged order. That power fixes our identity regardless of the transformations of the forms we identify with. The territory might be in suspense, but identity is forever free.